With 9 elements all together it is not that much more numerous than the other Ken's force but it has more focus on infantry and better ranged attacks potential. It has quite a few monsters too which gives it even more unique feel. 2 x 40 Bloodsworn - The Bloodsworn are warriors who have made a blood sacrifice to Korgaan in exchange for unnatural strength and resilience, Wearing heavy armour and armed with even heavier weapons, They form the solid core of Varangur forces. The core of the army, the Bloodsworn form a very reliable battle line, capable of holding many foes in place and deal damage in return. Headstrong and Fury make sure they can be relentless in their march towards the enemy lines. While sheer number of the attacks and Crushing Strength (1) is usually enough to damage any foe regardless of penalties due to terrain such a big formation may inevitable need to navigate through. break open the tombs of the Var’Kyr, the first of Korgaan’s ancient and forgotten followers. After a sanguinary ritual, the gargoyles’ essence containing their powers of regeneration was infused into the long dead remains of these ancient warriors, granting them life once more. The Fallen are deadly warriors that fight in loose formations to better bring their hefty glaives to bear, being able to move at speeds that would make an elf appear laboured. Very maneuverable and hard hitting unit, even more so with Brew of Strength upgrade. They can deal a decisive blow all by themselves, in particular when careless opponent leaves the flank unguarded (watch out for Cork-Screw Charges! :)). 2 x Devourer - Devourers are giant earth and rock-eating worms which inhabit the frozen north. Able to burrow underground and attack from unseen angles, these beasts are driven by Korgaan’s will to bypass enemy defences while remaining unseen to would be attackers. The pair of very maneuverable monsters that are even more flexible due to ability to provide ranged attacks support too. Effective range of 19" with the combination of Nimble means they will almost always find a way around the enemies to avoid any cover penalties. At the same time, their lower armor is nicely balanced out by a lot of special rules that allow to use the cover to the fullest and still be able to deliver full strength of the attacks in melee. Cavern Dweller - Cavern Dwellers are but one of the horrors found within the expansive northern ice caves. These colossal creatures are able to slow their metabolisms and go years without food. They lurk motionless in the darkness, waiting for their prey to wander within their ensnaring reach. They are blind but their remaining senses are highly tuned. With the willing assistance of the cruel cave trolls, a clan may risk the dangers of capturing one of these ghastly beings to keep it chained up for years. Starving and half mad, it will then be goaded to battle where its voracious appetite is then unleashed upon the enemy. Cavern Dweller is a tougher type of a monster that can be really hard to kill thanks to very good defense and regenerative abilities. It is a bit slower than the Devourers and has a random number of the attacks but can comfortably hold the flank against many units all by itself if needed. 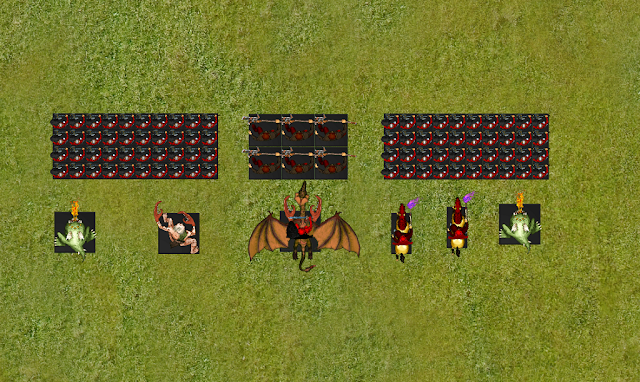 Or add its powerful attacks to support other units. These wizards are also very versatile, providing inspiration to nearby troops (one of them), having a good ranged attacks with Lightning Bolts and ability to finish off units nearby with Soul Drain to heal any damage lucky enemy may have inflicted so far. Defense 5+ is also very good to have on the otherwise fragile heroes. Although he cannot sport Defense 6+ armor anymore, the King is still a formidable warrior. With Chant of Hate upgrade his attacks are guaranteed to do maximum damage, be it at range or in melee. Rerolling 1's to hit and to do damage will always hurt, even in the frontal attack. With his flexibility and huge maneuverability, he can provide support to his troops and switch to individual missions at any time, keeping the enemy guessing as to where he can go next.